Thanking important donors and alumni by providing a small gift is commonplace for alumni and development offices. Emily Best, Alumni Relations Director and Development Officer from the School of Dentistry at the University of Minnesota was on the search for a unique and useful donor recognition gift. She wanted something that could be used at events held across the country and easily mailed as a follow-up thank you. This promotional item would serve as a reminder of the School of Dentistry, while showing their Minnesota school pride. Emily discovered the Smart Spot Smartphone Stand as part of our eNews and top new products for colleges. She reached out to Account Manager Elise Mannebach for more product details, and they determined that it was a great fit for their needs. 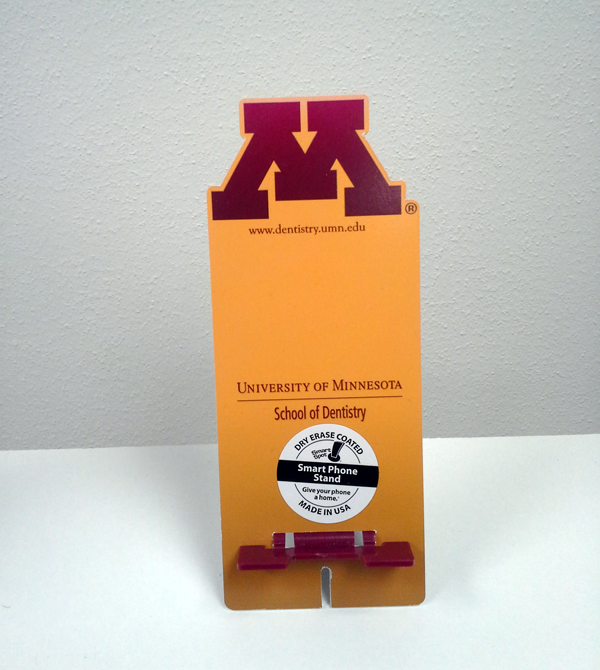 Image of the final smartphone stand for UMN School of Dentistry. One of our 2015 new products for colleges, the Smart Spot Smartphone Stand is a full color, custom shaped stand made of a rigid styrene material with a securely attached plastic kickstand that folds flat. It keeps a smartphone upright and elevated for easy access and viewing and out of the way in case a water glass or coffee mug is tipped over on a workspace. When a phone is on the stand, users still have the space and ability to plug in the charging cord. Choose from a matte, glossy or dry erase finish. Custom shapes can be formed in an area of up to 25 square inches, which is a lot of real estate for your brand! The Smart Spot is also made in the USA with up to 25% recycled content. The School of Dentistry debuted the smartphone stand at a recent event, using it at place settings for a dinner. It was warmly received and appreciated by attendees. Additional mailings are planned to be sent to donors throughout the year, as a way to say “thank you” with a useful, U of M School of Dentistry promotional item.